A very special edition of the original Lomo'Instant camera has been designed by KristopherH for Lomography x Fashion Walk: Be An Explorer —held in Hong Kong. With its wonderful new dress, the Lomo'Instant Explorer is now ready to go out into the world, into the hands of creative instant photographers. Designed by KristopherH for the Lomography x Fashion Walk. Lomography is thrilled to add incredible illustrator KristopherH to their long list of fantastic collaborators. From Nike to Facebook, KristopherH has created gorgeous illustrations for an impressive line-up of international brands — as well as his own stunning portfolio. His Lomo’Instant Explorer design is reminiscent of delicate blue and white china. A mass of intricate blue illustrations, his signature style transports us to a surreal city with fantasy ferris wheels, towering toadstools and humongous, rusty robots. 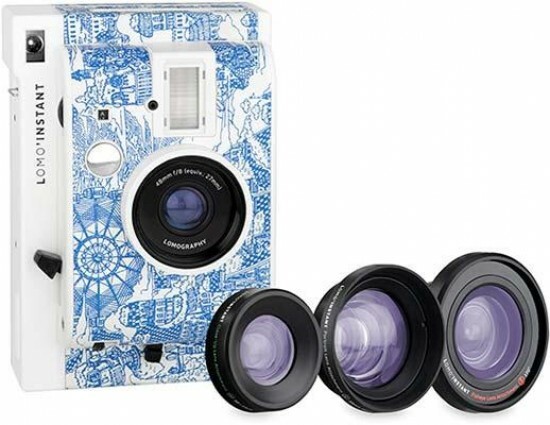 It’s a beautiful addition to Lomography’s colorful collection of creative instant cameras. The Lomo’Instant Explorer was specially designed by KristopherH for Lomography x Fashion Walk: Be An Explorer — held in Causeway Bay, Hong Kong. Now, Lomography is excited to bring it to creatives around the world. The Lomo’Instant Explorer will be available from the Lomography Online Shop and Gallery Stores for just 99 USD. You’ll also be able to pick up a combo package for 125 USD, which includes fisheye, closeup and wide-angle lens attachments to shake up your perspective. The Lomo’Instant is where Lomography’s adventures in instant photography all started — and it remains one of the most creative instant cameras out there. Built for free spirits who aren’t afraid to push the boundaries, it lets you layer up your composition with multiple exposures, take luscious long exposures, use color gel flash filters to tint your shots a whole new hue and so much more. With the Lomo’Instant, you can fill frame after frame of Fujifilm Instax Mini Film with your wildest imaginings, and hold your masterpiece in your hands just seconds later.